Join us for the semi-annual highway cleanup of Highway 221 (Third St.) from Highway 18 to Stringtown Rd. Two miles toward Salem. 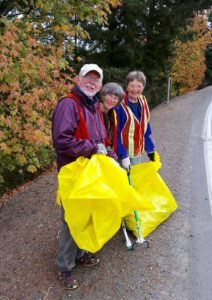 Join your civic-minded friends for a couple of hours making your assigned section of 221 trash-free and scenic. We’ll set out from the Blockhouse Café at 8 a.m. and normally finish around 10. Dayton’s Adopt-A-Highway project was started by John Francis and Caye Poe about seven years ago and soon became supported by DCDA. If you’d like to volunteer for the cleanup contact the organizers so they can plan out assignments in advance.